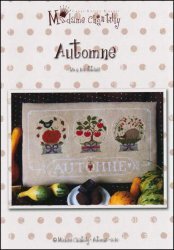 Automne (Autumn) [C6190] - $11.00 : Yarn Tree, Your wholesale source for cross stitch supplies. Three snow-globes filled with Autumn themed items; a hedgehog, a crow sitting on a pumpkin, and a tree covered with apples. Stitch count 176 x 102. Stitch count 176 x 102.